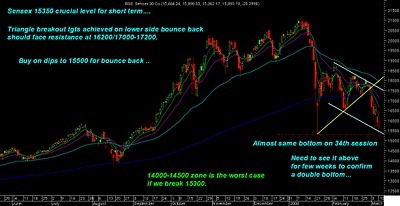 Sensex trying to hold above 15350 …. The triangle breakdown as was discussed before could see 15700-15800 as targets and on lower side 15350 the previous bottom which is achieved as of now. Good buying support seen today near to the previous low but needs to be seen for next few sessions to confirm the sustaining power. Sensex should try to stage a bounce back to 16200 and 17000-17200 on upside in coming weeks possibly. Breaking below 15300 can lead another drop to 14000-14500 which is a gr8 fundamental level and would not get breached in worst case and the luckiest place for long term investors if it comes. Medium term Investors who have pulled out money and have generated a good amount of cash or have fresh capital can look to deploy partial amount of cash at these levels and be ready to add more on dips or in stability . Large caps preferred would be reliance , SBI , BOB , ICICI Bank. Mid caps preferred in low risk Gtl Infra , videcon inds and other good funda stocks which have over corrected. High risk players can look to buy GMR infra, Gremach Infra , Viceroy Hotels, core projects , Indiabulls real estate , HDIL , DLF ,Unitech , Motial Oswal etc according to theri liking 10-15% qty intended on every 5% dip as these are all long term future stocks which have now seen a good correction as in bear sentiments nobody pays for growth but for balance sheet so right time for an investor with 1-2 yrs patience to multiply money. High risk players can buy Nifty one part at 4650 and next at 4580 if it comes . Investors can also look to buy with 15% of the cash at current levels in large caps. Nifty 4900 call at 70-80 with pure risk . HIGH risk buy Nifty 4900 call option at 80-85 considering it to be loss so buy small. Nifty futures close to 2nd tgt of 4770 book half of the qty bought and trail rest. SBI up at 1890 trail to 1830 . Reliance hold. Call 4900 at 117. Nifty 4900 call book another 25% at 135 + . So total half booked. 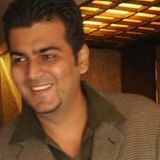 Also book part in SBI and Reliance at 1900+ and 2275 + . Nifty futures picked at 4650 went down till 4600 odd and on upside 4790+ booked half till 4770. so good 100+ points already and still half holding.